Mix a touch of medieval with a helping of Georgian – and throw in some thoroughly modern touches. The result? A unique family home perfect for 21st century living. 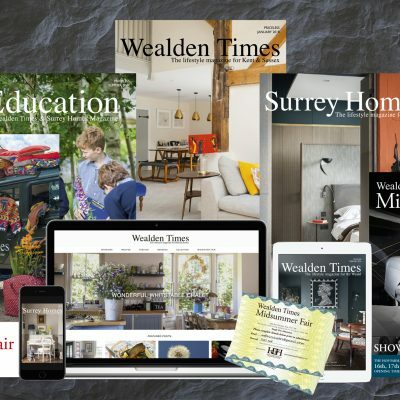 Tucked away in a pretty Kentish village, The Den has been home to textile designer, Julia Brendel, her husband Gerry Lee, their children, Alex and Mia, and dogs, Bruno and Gucio, since 2011. You wouldn’t guess from the exterior, but their spacious, light-filled farmhouse is a bit of a hybrid. The original Tudor building, dating to around 1520, was extended in the Georgian era. The Den oozes history and character. 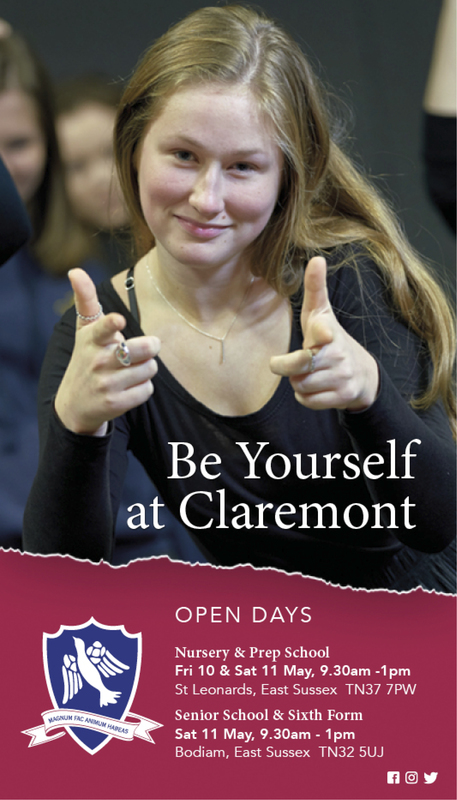 As well as being the original farmhouse to the neighbouring manor house which dates back to medieval times, in the early 1900s, it had a short life as a girls’ school. The sprawling property comprises the main two-storey building, a detached one-bedroomed coach house, a studio which houses Julia’s textiles business and a miniature thatched cottage, previously the farm’s dairy. 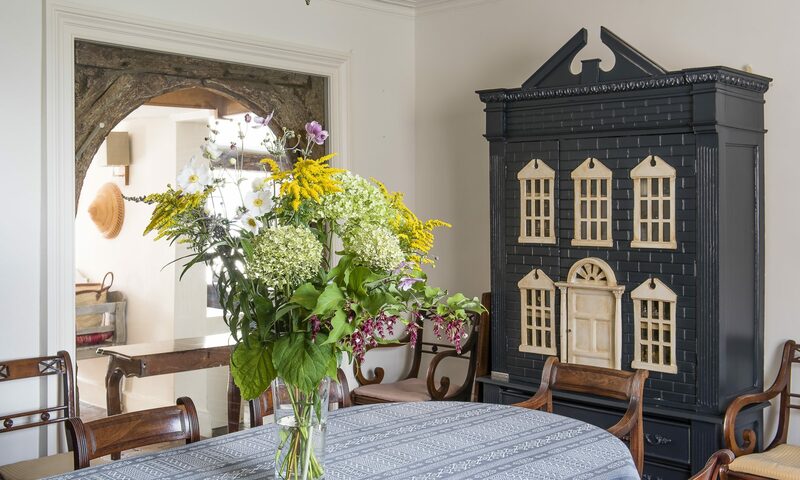 The charming Edwardian house they were leaving behind, while noisy was full of character and original features, so the hunt for a home with stacks of soul, plenty of space, and the non-negotiable prerequisite of peace and quiet began in earnest. The couple stumbled upon The Den by chance when another viewing was cancelled. The main draw wasn’t just that it had oodles of room, but that it had all the soul they were craving, and what Julia describes as a ‘big personality’. Both Julia and Gerry love the fact that the house has so much architectural history and is essentially rather quirky. ‘You can really appreciate the craft and skill used to build both the original Tudor and Georgian parts of the house, as there is so much exposed woodwork and brickwork on show,’ says Julia. The character of the house also created the perfect setting for the couple’s belongings. Polish-born Julia has travelled the world through her work as a textile designer, bringing back beautiful fabrics, ornaments and decorative pieces from as far afield as China and Gerry, who grew up in the States and Europe, also has a collector’s eye. 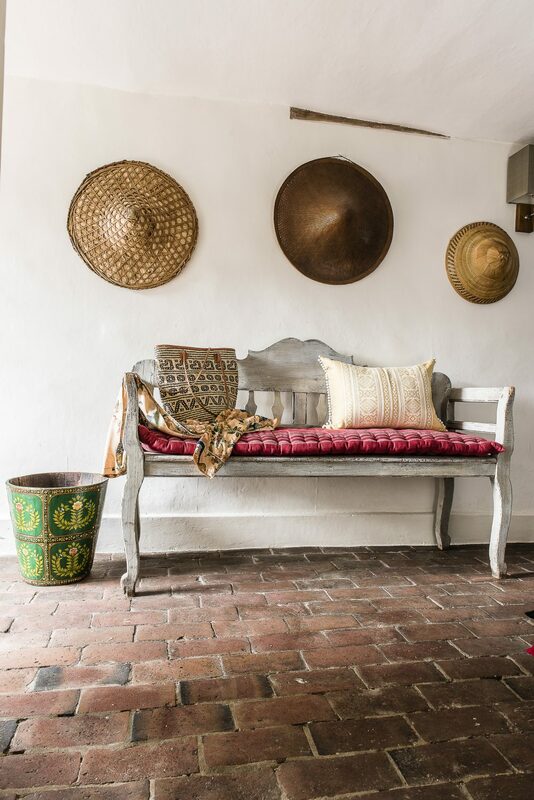 The entrance hall sets the tone for the rest of the house; an eclectic marriage of antique and exotic, with a sprinkling of utilitarian and contemporary items that keep the house family-friendly and anchored in the 21st century. 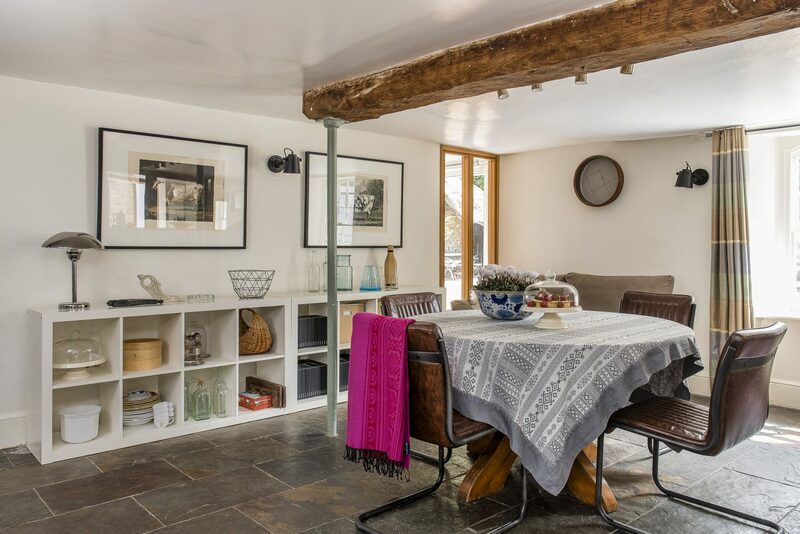 The beautiful brickwork floor, a remnant of the original medieval house gives the house solidity, while milky white walls keep things light and bright. Julia’s preference is for a neutral palette when it comes to decorating schemes, as it allows her to introduce colour and pattern with her own collection of textiles and the couple’s many treasured possessions. On the wall, a display of hats brought back from China accompanies a sturdy Hungarian country bench from one of the couple’s favourite local haunts, Barrow’s Antiques in Faversham. The bench cushion is covered in Julia’s Memory Stripe fabric. At the end of the hallway is a beautiful glazed arched window. ‘The wooden arch was part of the Tudor building and is one of our favourite features,’ reveals Julia. 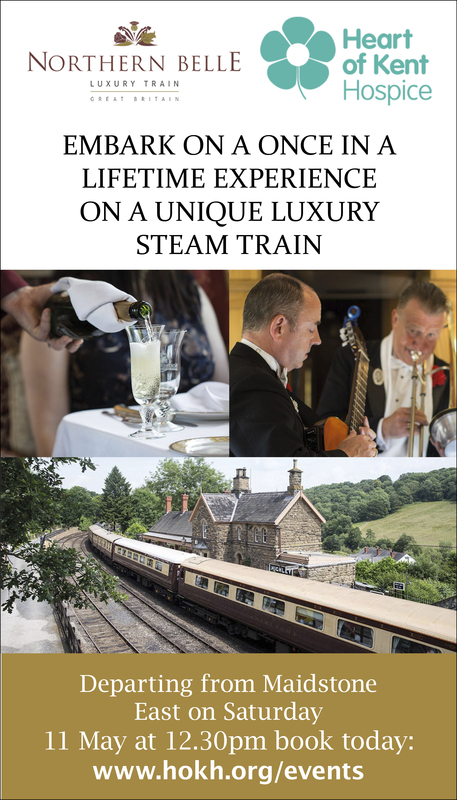 That’s because the open-plan kitchen and dining room allows for plenty of socialising while the family cook and eat. A modern floor-to-ceiling window is a recent addition, allowing light to cascade in. The slate flooring benefits from underfloor heating and continues throughout this part of the house. Contemporary Ikea Kallax shelves and a retro-style Ikea chrome lamp sit perfectly alongside period furniture and are the ideal place for Julia to store her fabric lookbooks and to display collections of china and glassware. Perfect for family dinners, the large circular table is made from 17th century oak from a French oak stable door and was a present to Gerry from L & E Kreckovic, an antique dealer and friend of his parents in London’s King’s Road. The comfy faux leather-upholstered dining chairs look vintage but are actually a clever purchase from Wayfair.com. The blue and white ceramic Chinese bowl was picked up in an antique shop in Hampton Court. 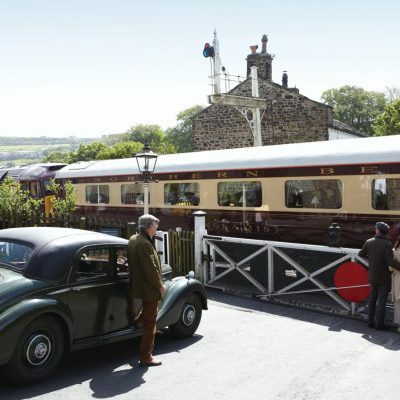 ‘It’s a modern reproduction, not an antique, but I love it,’ says Julia. 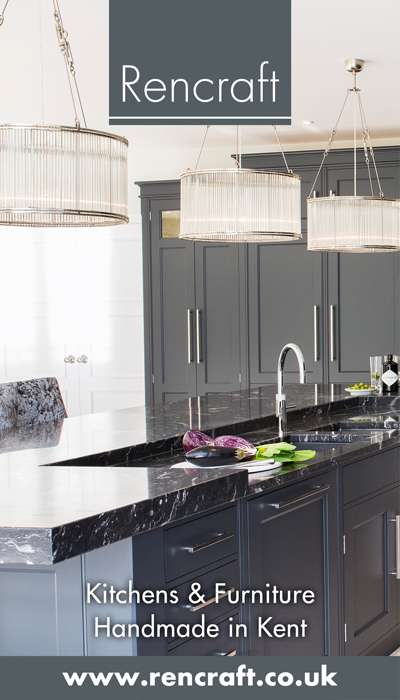 The contemporary eau-de-nil kitchen units, inherited from the previous owners, keep things practical, while the glass handles add a touch of glamour. Julia is a keen cook and grows her own fruits and vegetables in the garden, so when she is not in her studio, she loves to be in the kitchen. ‘It’s a light, bright space,’ she enthuses. The Ikea Udden kitchen trolley is the perfect mobile store for Julia’s favourite herbs and spices, oils and vinegars and her prized collection of bowls from The Living Lounge, in Canterbury. 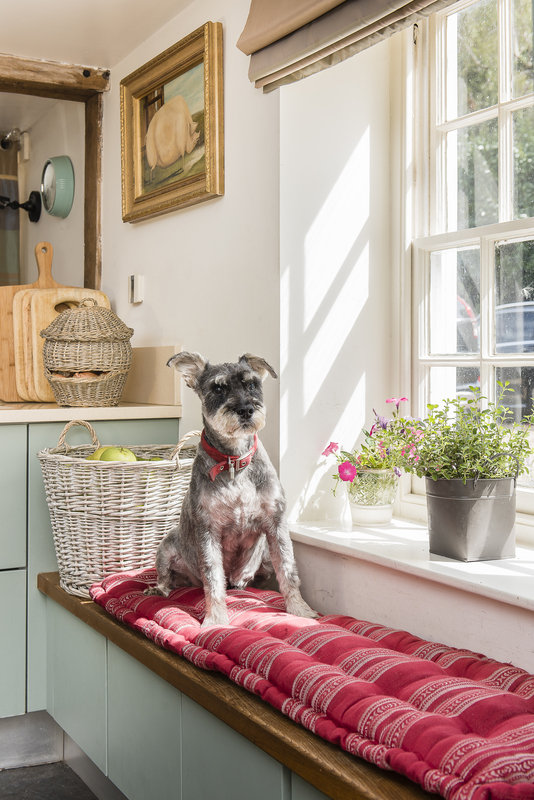 The window seat sports a cushion in Julia’s Memory Stripe fabric in Red which was made by Jo Ellis from Mabel and Me Interiors. At the end of the entrance hallway, a passageway lined to one side with bookshelves, leads to an elegant sitting room with dividing doors to a music room, home to the family’s grand piano. These rooms have an air of colonial grandeur. The ceilings are higher in this part of the house, which dates to the Georgian period, and as a result, it feels airier. The sitting room is furnished with a clever mix of vintage and antique shop finds, all of which are in keeping with the grand scale. Comfy sofas and squashy armchairs – one of Julia’s favourite pieces is a blush pink velvet armchair she bought from Barrow’s Antiques in Faversham – are perfect for relaxed evenings with friends and family. The couple’s passion for the exotic is illustrated by decorative pieces like the Indian serving tray on the low, antique table. 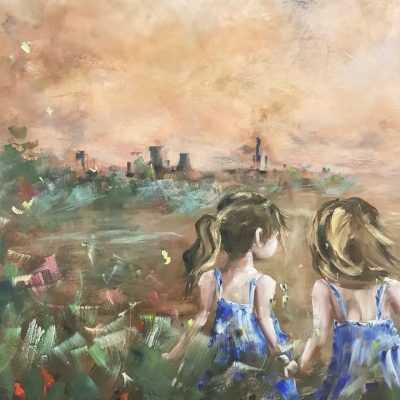 ‘I bought it recently in Provence when we were on holiday – a bargain at just 20 euros,’ reveals Julia. She also likes to mix things up by combining classics with a bit of contemporary. A glass Vittsjo coffee table from Ikea displays Gerry’s prized collection of ornamental elephants and the oval ‘negative-space’ central lampshade was a steal from Homebase. The glass chandelier above the table is from L’Image, an antique shop in nearby Whitstable. 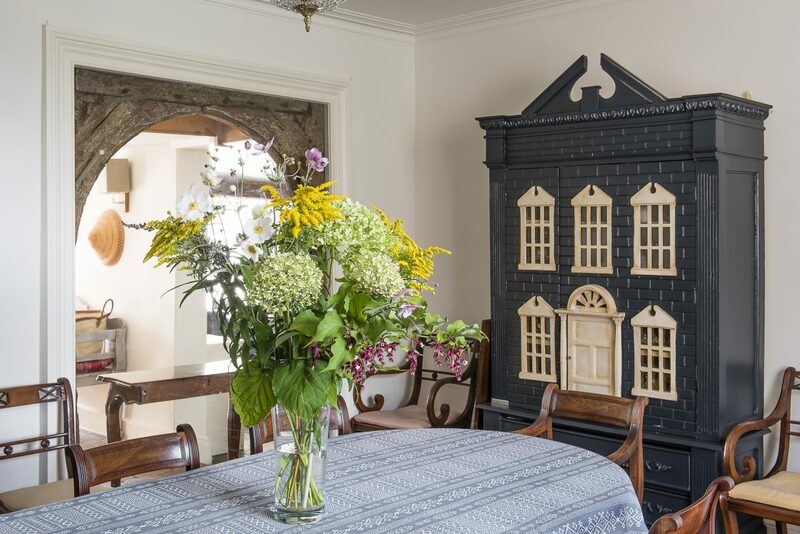 Pride of place is a gigantic doll’s house. Julia opens the doors to reveal an interior that houses ceramics and glassware rather than dolls and furniture. ‘I bought it in an antique shop in Gillingham that has long since closed and repainted it in Farrow & Ball Railings which matches the wall above the fireplace. Gerry’s study, painted in Farrow & Ball Castle Grey and fitted with bookcases, is reminiscent of an elegant gentlemen’s club and is kept cosy by a wood burning stove. 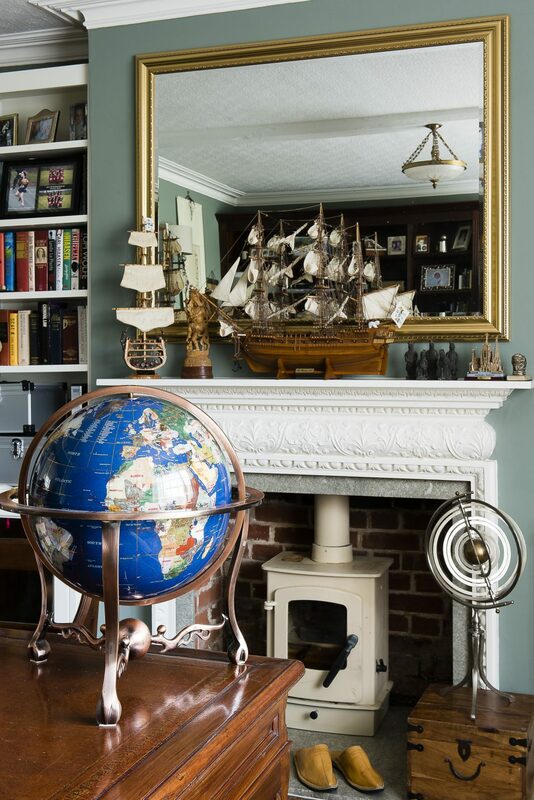 Some of his favourite ornaments, including a model ship bought by the couple in Mauritius on their honeymoon, are displayed on the mantelpiece. A grand, sweeping staircase leads upstairs to five bedrooms, a spacious family bathroom and an en suite adjoining the master bedroom, which is a haven of tranquillity. 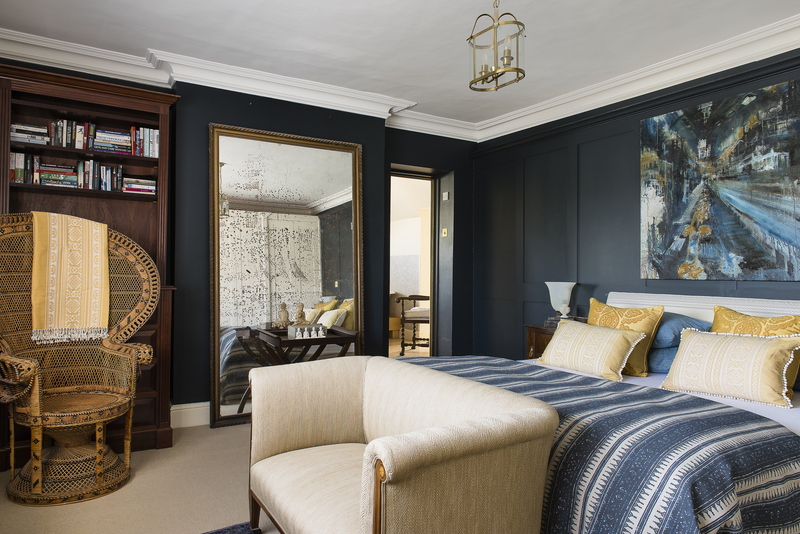 Elegant panelled walls in the Georgian style have been painted in Farrow & Ball’s Downpipe – one of Julia’s favourite colours – and fitted wardrobes keep things neat and orderly. 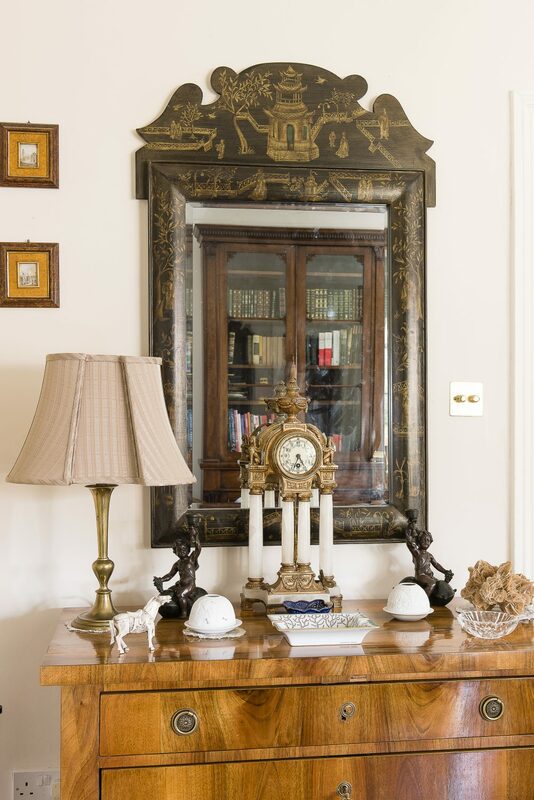 A floor-to-ceiling foxed, gilt-framed mirror from Peter Barrow Antiques in Faversham reflects soft light into the room, furnished with finds from antique shops and auctions. The generous Valencia bed is fom John Lewis and has a headboard upholstered in Julia’s Hungarica fabric in Gunmetal. 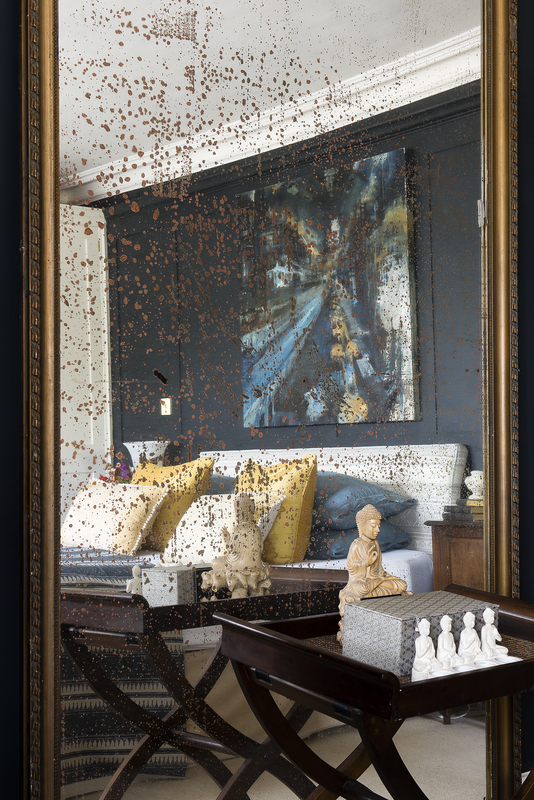 The eye-catching painting above the bed – a contemporary work by artist Kira Speiser – combines the palette of greys, golds and blues. In the spacious guest room overlooking the garden, the bed has been reupholstered in Julia’s Medallions fabric. 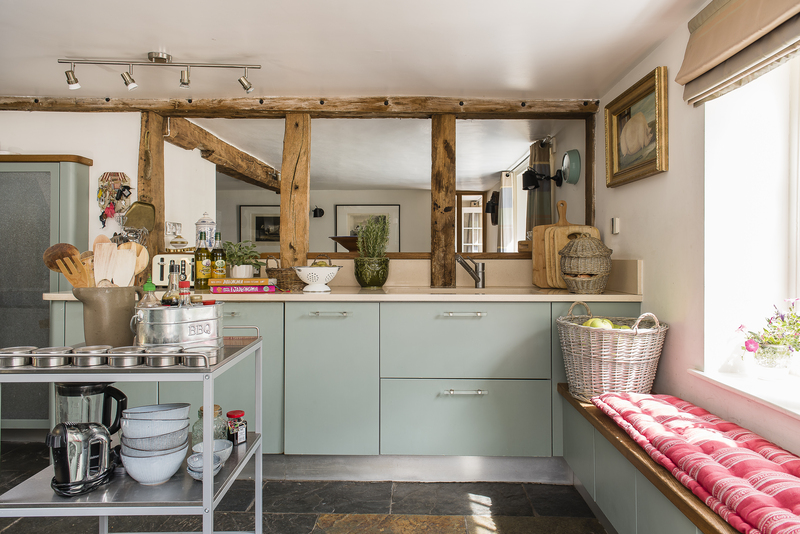 Putty-coloured walls offset exposed beams and newly laid wood flooring. 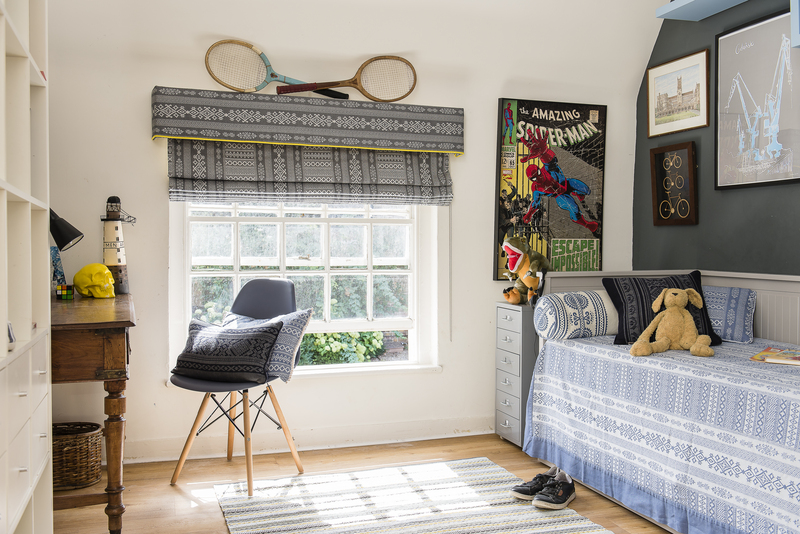 The children’s bedrooms are furnished with the same mix of old finds and contemporary buys, as practicality is something Julia values in a family home. Her teenage son’s Ikea storage bed can be extended to make extra room when friends come to stay. His vintage desk was bought in an antique shop in Fulham, and is partnered with a Charles Eames-style Eiffel chair. The rug, from Habitat, adds cosiness. The blinds, cushions and throws are all made with Julia’s fabrics. When it comes to the family bathroom, once again Julia has effortlessly combined ultra-modern with historical. The original Tudor beams are juxtaposed with modern ceramic tiles and a generously proportioned bath that would look at home in any spa. A vintage painted cabinet with a chicken-wire front is ideal for storing towels and linen and a modern wooden bench is the perfect perching place to indulge in a bit of pre or post-bathtime pampering. One of Julia’s favourite rooms (and I have to say, the room that I am most in love with) is the aptly named ‘Traveller’s Room.’ Inspired by her travels to Morocco (where she stayed in a Berber tent in the desert) and to China to visit her sister, the room is the embodiment of globalism. The walls, painted in her favourite Farrow & Ball shade, Downpipe, are the perfect backdrop to her collection of objets which are showcased alongside her own Polish and Hungarian-inspired fabric designs. ‘One of my favourite things is the Chinese dowry cupboard bought from an antique shop in Bath – a present from Gerry when we got engaged.’ A 1950s ebonised chair has been reupholstered in Julia’s Africana fabric to give it a new lease of life. 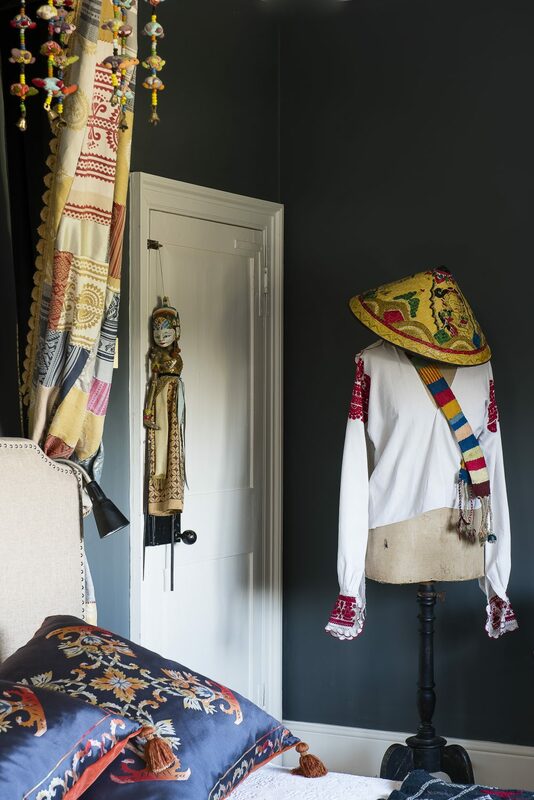 Theatrical ‘props’ contribute to the character of this room which is very much a melting pot of Julia’s design influences, including a Balinese puppet which hangs by the bed and a French tailor’s dummy which Julia has dressed in a vintage folk Polish shirt, a sash made from a woven Moroccan belt, topped by a Chinese hat. The bed displays super-sized cushions inspired by Polish cut-outs, the throw is Moroccan. 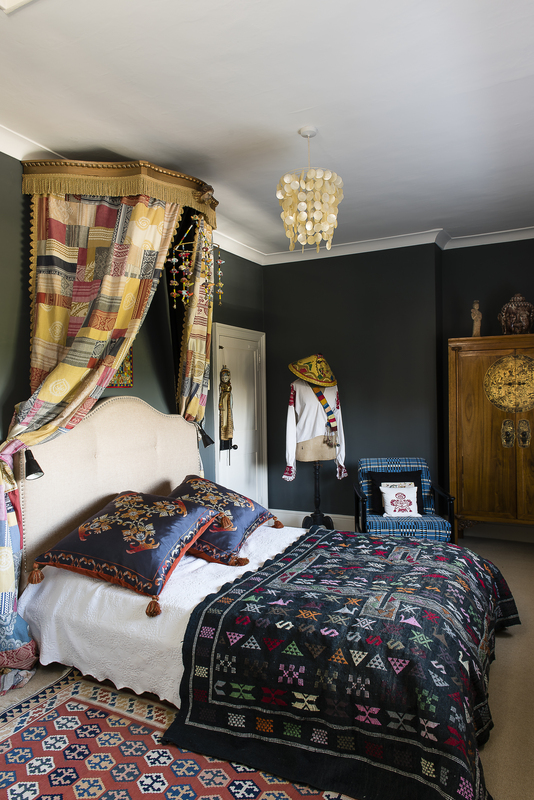 The piece de resistance is the beautiful patchwork canopy that hangs over the bed, made from multi-coloured remnants of Julia’s fabrics. It’s this mix of eras and cultures, along with the harmonious blend of ancient and modern, and the wealth of historic features partnered with all the mod cons, that really sums up The Den’s uniqueness as a family home. ‘It’s difficult to explain,’ says Julia, ‘but as soon as we moved in, we felt that we belonged here. It never felt strange or new.’ Sometimes, it seems, houses and people are just meant to be together. 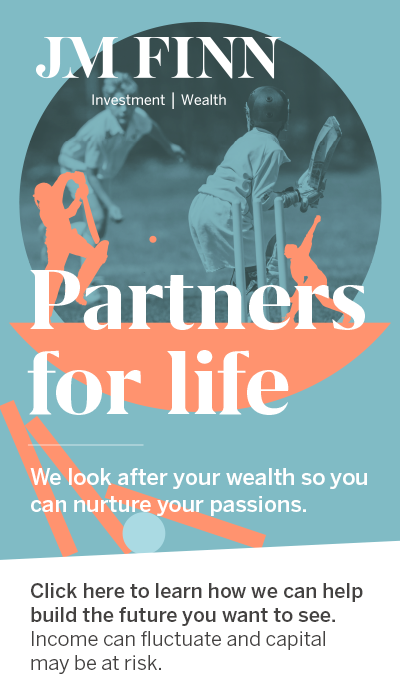 Advertise with Kent, Sussex and Surrey's leading free Lifestyle Magazines and Website.